This is a book of ferocious imaginings, which builds on two earlier pamphlet collections. Good to see that so-called smaller presses are continuing the valuable work of bringing newer voices to the attention of the reading public. 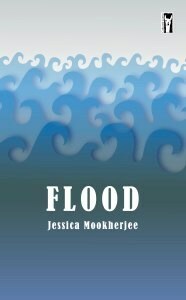 Many first full collections are, in effect, a Selected Earlier Poems, and the range and variety of work offered here suggests that Flood is no different. How quickly the shame sets in. My Bengali mother had no idea why I wore a daffodil. and told me why I wore a black hat on St. David’s Day. says I’m not in England now. elephants, tigers and monkey gods, noble beasts . . . .
Hardly surprising then, that ‘Scars’ relates what I hope was a teenage experience of a first cigarette, and possibly first sexual encounter. scars carved on the cave wall. In ‘Dawn Chorus’, the narrator is seventeen, while in ‘Hungry Ghosts’ we are introduced to someone who might be the same character, self-harming. Half-Asleep Roger sold them marijuana in the yard. ends off blotting paper. They cast them like I-Ching. He told her she was a shape-shifter like him. This poem, which could be an excerpt from a contemporary crime novel, does not, of course, have a happy ending. Other poems such as ‘Growing Up in Nightclubs’ , ‘Full Moon Over Finsbury Park ‘ and ‘House on Fire’ also evoke a certain lifestyle prevalent in north London in the early 1990s. You still have that dirty tongue and a strong-man swell. listen to your list of moans and ready-meals. ‘Having My Sister for Dinner’ is a title that recalls Hannibal Lector’s comment that he is having a friend for dinner, but the poem is, I think, an attempt at reconciliation between siblings who are estranged, or have just lost contact with each other – something hardly surprising if we look back to ‘Wildlife’! apart in a burning house, to what might have been. in sheep’s clothes, skin primed – made an effort that day. unable to see, what he’d become, what he’d done. and fridges exploded – and their children died. the smallest i have ever seen. Now that is certainly a note on which to finish your first book. Whether Mookherjee’s cage owes anything Plato’s cave, an allegory of how knowledge leads to freedom, I cannot say; but the trope of a broken cage, and the flood of music and creativity being released is powerful. As usual, a note on the book’s production values is appropriate; the typeface is large enough to be easily readable, although one poem, ‘The Thirst’ was printed sideways to accommodate the longer line employed in this poem. There were however eight or so typos which should have been corrected before the book went to print, and it is to be hoped that these will be amended if the book is reprinted. If this seems an ungracious note to end on, it is only because your reviewer enjoyed reading this book, and having heard the poet read and discuss her poems, she does not seem the sort of person to tolerate sloppy work.